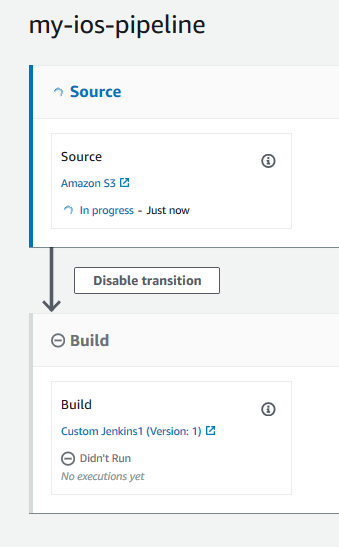 You can use AWS CodePipeline to easily configure a continuous integration flow in which your app is tested each time the source bucket changes. This tutorial shows you how to create and configure a pipeline to test your built iOS app from an Amazon S3 bucket. The pipeline detects the arrival of a saved change through Amazon CloudWatch Events, and then uses Device Farm to test the built application. You can try this out using your existing iOS app, or you can use the sample iOS app. Create or use an Amazon S3 bucket with versioning enabled. Follow the instructions in Step 1: Create an Amazon S3 Bucket for Your Application to create an Amazon S3 bucket. In the Amazon S3 console for your bucket, choose Upload, and follow the instructions to upload your .zip file. Your sample application must be packaged in a .zip file. Sign in to the AWS Management Console and open the CodePipeline console at https://console.aws.amazon.com/codepipeline/. Choose Create pipeline. On the Step 1: Choose pipeline settings page, in Pipeline name, enter the name for your pipeline. In Service role, leave New service role selected, and leave Role name unchanged. You can also choose to use an existing service role, if you have one. If you use a CodePipeline service role that was created before July 2018, you must add permissions for Device Farm. To do this, open the IAM console, find the role, and then add the following permissions to the role's policy. For more information, see Add Permissions for Other AWS Services. Choose Default location to use the default artifact store, such as the Amazon S3 artifact bucket designated as the default, for your pipeline in the region you have selected for your pipeline. On the Step 2: Add source stage page, in Source provider, choose Amazon S3. In Amazon S3 location, enter the bucket and object key for your .zip file. In Build, create a placeholder build stage for your pipeline. This allows you to create the pipeline in the wizard. After you use the wizard to create your two-stage pipeline, you no longer need this placeholder build stage. After the pipeline is completed, this second stage is deleted and the new test stage is added in step 5. In Build provider, choose Add Jenkins. This build selection is a placeholder. It is not used. In Provider name, enter a name. The name is a placeholder. It is not used. In Server URL, enter text. The text is a placeholder. It is not used. In Project name, enter a name. The name is a placeholder. It is not used. On the Step 4: Add deploy stage page, choose Skip deploy stage, and then accept the warning message by choosing Skip again. On Step 5: Review, choose Create pipeline. You should see a diagram that shows the source and build stages. In the upper right, choose Edit. Choose Edit stage. Choose Delete. This deletes the placeholder stage now that you no longer need it for pipeline creation. At the bottom of the diagram, choose + Add stage. In Stage name, enter a name for the stage, such as Test, and then choose Add stage. Choose + Add action group. In Action name, enter a name, such as DeviceFarmTest. In Action provider, choose AWS Device Farm. Allow Region to default to the pipeline Region. In Input artifacts, choose the input artifact that matches the output artifact of the stage that comes before the test stage, such as SourceArtifact. In the AWS CodePipeline console, you can find the name of the output artifact for each stage by hovering over the information icon in the pipeline diagram. If your pipeline tests your app directly from the Source stage, choose SourceArtifact. If the pipeline includes a Build stage, choose BuildArtifact. In ProjectId, choose your Device Farm project ID. In DevicePoolArn, enter the ARN for the device pool. In App, enter the path of the compiled app package. The path is relative to the root of the input artifact for the test stage. Typically, this path is similar to ios-test.ipa. If you're using one of the built-in Device Farm tests, enter the type of test configured in your Device Farm project, such as BUILTIN_FUZZ. In FuzzEventCount, enter a time in milliseconds, such as 6000. In FuzzEventThrottle, enter a time in milliseconds, such as 50. If you aren't using one of the built-in Device Farm tests, enter your type of test, and then in Test, enter the path of the test definition file. The path is relative to the root of the input artifact for your test. In the remaining fields, provide the configuration that is appropriate for your test and application type. (Optional) In Advanced, provide configuration information for your test run. On the stage you are editing, choose Done. In the AWS CodePipeline pane, choose Save, and then choose Save on the warning message. To submit your changes and start a pipeline execution, choose Release change, and then choose Release.